M12TR Reusable Co2 Powered Trip-Wire Mine M-12TR TRIPWIRE MINE If you’ve had the pleasure (or misfortune) of seeing Major Paintballs “M-80TR Exploding Landmine” in action then you will have more appreciation for the New M-12TR Tripwire mine. The complete four piece incredible Shaft FL Carbon Fibre Barrel System made in collaboration with DeadlyWind. Our founder who fell in love with the sport of paintball through a corporate team building event, found it very difficult to find gear at affordable prices in Tampa. Barrel insert is for display only and is not included. Barrel front is for display only and is not included. Aluminum anodized gloss black. 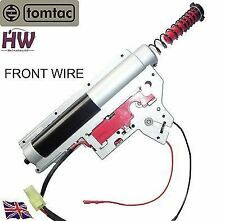 TOY AIRSOFT TOMTAC GEARBOX TO FIT TM TOKYO MARUI TYPE AEGS. HIGH QUALITY AEG 8MM GEARBOX. V2 VERSION 2. QUICK RELEASE SPRING: CHANGE THE SPRING IN SECONDS JUST TWIST AND PULL OUT. NOW WITH TEFLON COATING AND IMPROVED CYLINDER. FSC and all T9.1 Rifles Features: Fits T8.1. FSC and All T9.1 Rifles. 683 Rifled For FSR and shaped Projectiles Made in the USA. FS and Lapco have co-designed the FSR barrel to fitT8.1. FSC and all T9.1 Rifles. Milsig Marksman Elite Rifled Barrel - 300mm As included with many Elite models in the past, this bull barrel is now available on its own. Features: Precision machined and rifled. As included with many Elite models in the past, this bull barrel is now available on its own. Tippmann TMC RIS Handguard Barrel Nut This RIS Standard Barrel Nut Adapter works with Tippmann TMC to attach the RIS hand guard. It will simply screw onto the front of the gun allowing your handguard to be free floating. Paintball shells are made of gelatin - they are soft and when they are exposed to humid or climate that is less than ideal - paintball will change their shapes - causing dimples and other abnormalities. Tactical Barrel Kit - 98, Alpha Black, Project Salvo This barrel kit is compatible with Tippmann 98, US Army Alpha Black, Project Salvo, Carver One, and Sierra One markers. Improve your marker distant and accuracy with this tactical barrel kit. Back Threads: GOG Freak XL. Smart Parts revolutionized paintball barrels with the Freak System, a modular barrel kit comprised of a back, front and sized inserts to allow maximum paint-to-bore match. Cut outs to read what size Freak Insert is in use. Smart Parts Freak XL Carbon Fiber One Piece Barrel - Impulse / Ion / Luxe - 14"
We also carry our own rapidly growing line of custom products including tanks, t-shirts, barrel covers, tech mats and goggle bags. Most importantly, all of the Wicked Sports staff play paintball. All of our employees get out to the field as often as they can. Back Threads: Classic 5" Freak Kit. GoPro Deluxe Barrel Mount. Check out the new Deluxe version GoPro Mount that is sleeker and stronger GoPro Reverse Case Mount. It is designed for scenario paintball markers such as those from Tippmann, Smart Part Paintball, and our RAP4 T68! It is designed on the outside for looks and engineered on the inside to greatly improve accuracy and reliability. This is a folded double sided swab for the field. Won't scratch your barrel. Can be folded in half. Our founder who fell in love with the sport of paintball through a corporate team building event, found it very difficult to find gear at affordable prices in Tampa. Molded, ultra- tough shafts resist breaking and shattering and fibrous shaft polishes bore and removes oily paint residue. MK23 II Socom Thread-On Muzzle Brake (.68) [FK3] This is a thread-on silencer with 22mm threads, easy to installation and removal. 22mm muzzle threads compatible to This is a thread-on silencer with 22mm threads, easy to installation and removal. © Modern Combat Sports. RAP5 MP5 Paintball Gun Parts #5305 Fire Selector [CJ5-4-1]. RAP5 MP5 Paintball Gun Parts #5308 Locking Screw [CJ5-5-1]. #2 Tiberius Arms FS T15 Sleeve AR12A102 [OS12-3]. You might also like. When inserted into the barrel, the Blade sits at a resting position for smooth entry. HK Army Blade Barrel Swab / Squeegee. Our founder who fell in love with the sport of paintball through a corporate team building event, found it very difficult to find gear at affordable prices in Tampa. Precision machined and rifled. RAP5 MP5 Paintball Gun Parts #5308 Locking Screw [CJ5-5-1]. RAP5 MP5 Paintball Gun Parts #5305 Fire Selector [CJ5-4-1]. © Modern Combat Sports. Must be new and unopened. RAP4 DMag 30 Round Paintball Loader RAP4 DMag 30 Round Paintball Magazine - Single [BU1] DMag 30 Round Magazines are designed to function flawlessly with traditional. 68 caliber paintballs, in paintball guns designed with a DMag-compatible magazine well. Enjoy your Classic 5" Freak Back with your factory MacDev Shift Barrel Tip!